Filters were applied to obtain the above object counts for an Office 365 deployment. So clearly these filters are configured somewhere - but where? 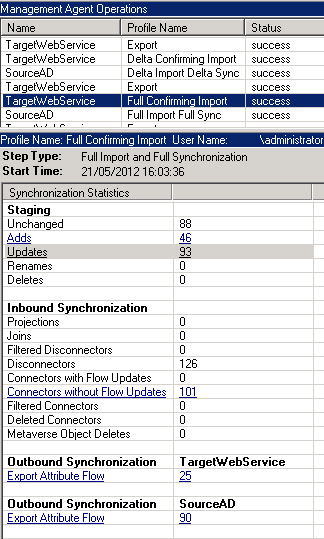 Hunting around on the web, I've found a very useful post for the initial setup scenario from credera: Filtering Users in the Office 365 Directory Synchronization Tool where they talk about using the UI based on Forefront Identity Manager (FIM 2010) - and suggest you run this before DirSync runs. I failed to realise the implication of one aspect of this: Even if you clear the "Synchroize directories now" so DirSync doesn't force the update, you've started the service and the 3 hour timer - so don't start this just before you go home for the weekend, otherwise you'll end up with all your accounts online like I did. So how do you implement filtering after you've done initial import? Well, it's not too painful once you've looked around at the systems. Start by firing up the Synchronization Service Manager through using the miisclient.exe executable found deep in the Sync Service's UIShell folder, and switch to the "Management Agents" pane. Click on the "SourceAD" Management Agent line, and select Properties. 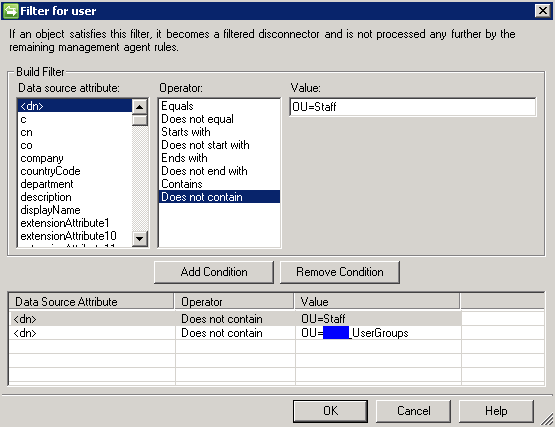 "<dn>" "Does not contain" "OU=Staff"
"<dn>" "Does not contain" "OU=Company_UserGroups"
From the Actions menu, select "Run..."
Ensure that "SourceAD" Management Agent is selected in the top dropdown, then select "Full Import Full Sync" from the list of Run profiles, and press "OK". Once that operation shows has a status of "success", select "Run..." again, and this time switch to the "TargetWebService" management agent, and choose the "Full Confirming Import" run profile, and press "OK". Once that operation also shows a status of "success", you'll want to run the "Export" profile for the "TargetWebService" management agent. As you can see, after each run you should see confirmation of deleted accounts in the reports. To confirm that they've really gone away, you can then fire up forced run of the standard sync using the powershell command Start-OnlineCoexistenceSync if you run the DirSyncConfigShell powershell script from the root of the DirSync install folder, or by re-running the Directory Sync Configuration Tool. Just deleting the users from Office 365 using the Remove-MsolUser command obviously didn't work as they were just recreated again with the next diffential sync. 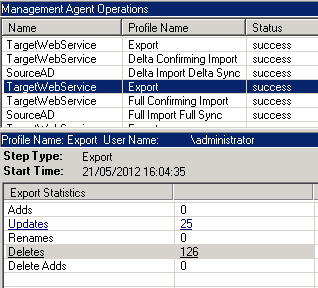 The management agent "SourceAD" completed run profile "Delta Import Delta Sync" with a delta import or delta synchronization step type. 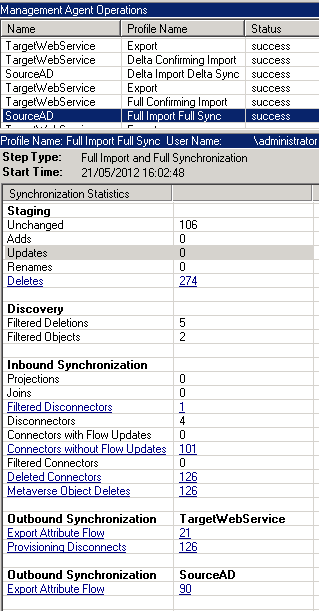 The rules configuration has changed since the last full synchronization.